“Fossil trees that approached the heights of today’s tallest redwoods have been found in northern Thailand. Eucalyptus (gum trees) of Australia and Sequoia (redwoods) of California. can reach about 130 meters (425 feet) in height. Interestingly, there are no trees living today in Thailand that approach the size of the ancients. The sediments in which the fossil trees were found suggest that they lived in a wet forest at the edge of a lowland plain. Today the fossil trees are at an elevation of 170 meters (550 feet) above sea level and the climate flips between wet and dry seasons — what’s called monsoonal. .
As to why there were big trees in the past that are unrelated to today’s giant trees, (except when the trees are in light of greater ancestry) . . . Images: The largest unbroken petrified tree trunk in the world (right). 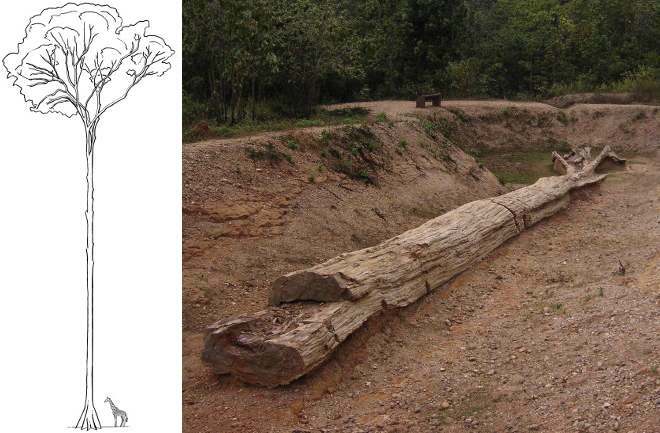 The reconstructed tree with a modern giraffe beside it for scale (images courtesy of Marc Philippe, Université de Lyon).